CHITTAGONG, Bangladesh, April 4, 2014 (ENS) – Four shipbreaking workers were killed and three others were critically injured Thursday when a gas cylinder exploded in a shipbreaking yard in Chittagong. The four workers, Jasim, Faruk, Arif and Gias Uddin, died after inhaling carbon dioxide. The three injured workers were rushed to hospital. “This sad accident shows the clear lack of safety measures in the industry,” says Muhammad Ali Shahin, Bangladesh coordinator of the NGO Shipbreaking Platform, a Brussels-based coalition of environmental, human rights and labor rights organizations working for safe and clean ship recycling worldwide. The accident occurred at the shipbreaking yard of Arafin Enterprise, a member of the Bangladesh Ship Breakers Association, which claims to ensure “environment friendly ship recycling activities.” Bangladesh has been the world’s most active ship recycling nation since 2003. According to “The Daily Star,” the largest English-language newspaper in Bangladesh, the yard claims to have had all necessary safety measures in place and to have provided the workers with personal protective equipment, which the workers then chose not to use. 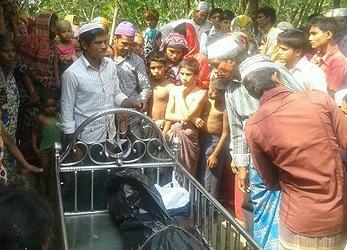 But the father of deceased foreman Jasim told “The Daily Star” that his son was never provided with safety gear. Before dying one of the workers alerted his family and the yard managers of the accident via his mobile phone. The families rushed to the yard, but found the gates locked. 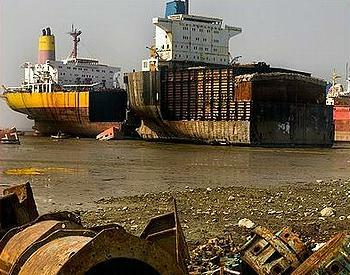 Shipbreaking involves the dismantling of old ships for scrap recycling of their steel and other equipment on board. Around one million tonnes of steel are dismantled in Bangladeshi shipyards every year. The country’s shipbreaking industry provides direct and indirect employment for about 200,000 people. The NGOs blame operators of shipbreaking yards and ship owners for the death toll of five workers so far this year in Chittagong, and at least 23 deaths among workers in Bangladeshi shipbreaking yards in 2013. “This fatal accident could have been prevented,” said Patrizia Heidegger, executive director of NGO Shipbreaking Platform. “We demand that the shipbreaking industry takes measures to prevent accidents and injuries instead of trying to cover them up,” said Heidegger. Many deaths go unrecorded as there is no official register of workers. Shipbreaking workers in South Asia are exposed to toxic fumes on a daily basis. They risk being crushed by falling steel plates, and they are exposed to toxic waste, such as asbestos, that can cause cancer and other fatal diseases many years later.